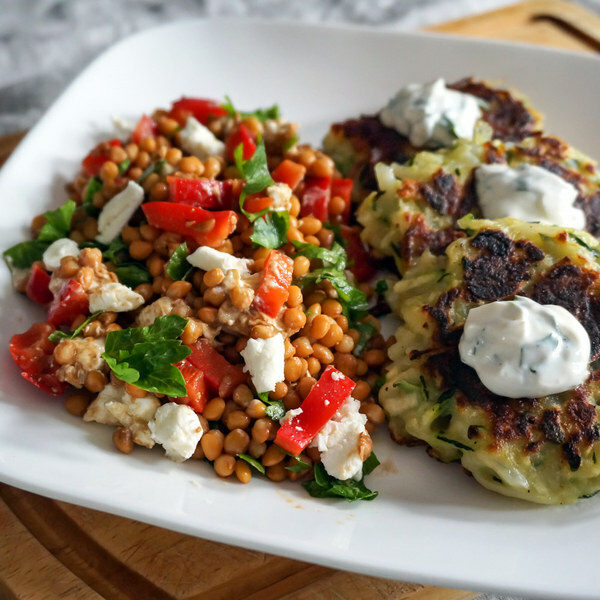 ← Zucchini & Potato Fritters with Lentil, Bell Pepper & Goat Cheese Salad. Rinse lentils under cold water and transfer to a medium saucepan. Add water and salt; bring to a boil. Reduce heat to a simmer and cook until tender, 15-25 minutes. Wash and dry zucchini, potatoes, bell peppers, and parsley. Coarsely grate the zucchini. Peel and coarsely grate the potatoes. Place both in the middle of a clean tea towel, bring the corners together, and squeeze out excess moisture. Transfer to a medium bowl. Heat a skillet over medium heat. Add oil, flour, salt, and pepper to bowl and mix. Form into patties (about 12) and place on a plate. Coat bottom of skillet with oil. Add about ¼ cup portions of zucchini mixture to skillet and flatten with a spatula. Cook until crispy and browned, 3-4 minutes per side. Transfer to a plate. Shave parsley leaves off the stems; discard the stems and mince the leaves. In a small bowl, prepare sauce by mixing together ½ of the minced parsley (save the rest for the salad), yogurt, salt, and pepper. Set aside. In a medium bowl, prepare dressing by whisking together oil, vinegar, Dijon, salt, and pepper. Add remaining parsley to bowl with dressing. Seed, cut into small strips, and add bell peppers to bowl. Crumble goat cheese into bowl. Drain lentils, add to bowl, and toss salad. To serve, place fritters on a plate, top with yogurt sauce, and have salad on the side. Enjoy! Get this and other great recipes in a personalized weekly meal plan with Mealime's free app.